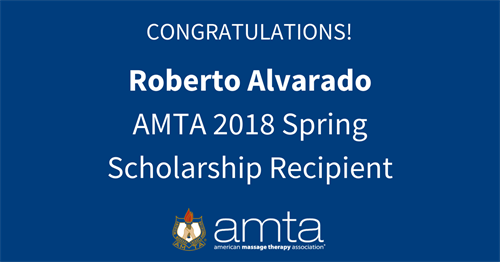 AMTA is excited to congratulate Roberto Alvarado of the Cortiva Institute in Seattle, the recipient of the AMTA 2018 Spring Scholarship! AMTA is thrilled to support the next generation of massage therapists in many ways including our scholarship programs. If you’re a current massage student, you can apply for the $5,000 Bob King AMTA Massage Therapy Student Scholarship! The deadline is coming up on December 7th!